The main problem with growing vegetables is controlling garden pests so that your produce actually makes it to the table. Insect control for a vegetable garden can be a little tricky, because you don’t want to use potentially harmful chemicals on plants that will produce food to be eaten. It's best to use methods of natural insect control for your vegetable plants, which won’t harm pets, children or the environment and are safe for human consumption. Insecticidal soaps are easy to make and inexpensive. Make an organic spray from mild soap, light vegetable oil and water, and spray it directly onto soft-bodied insects to repel them. 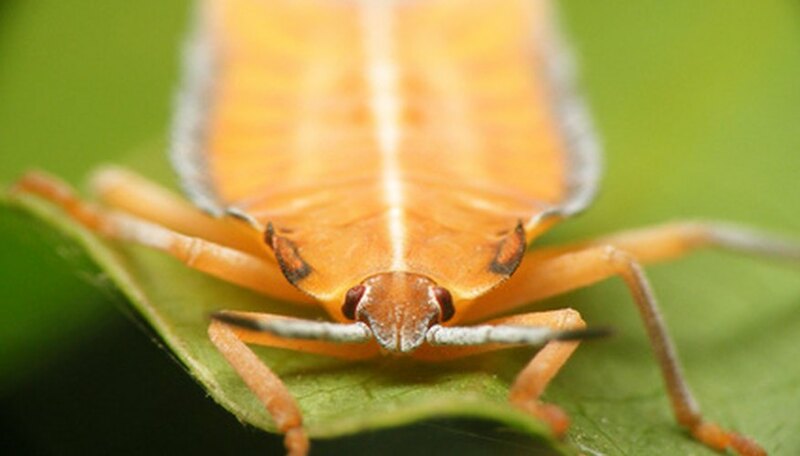 Natural teas and foliar sprays are also effective deterrents, often targeting specific insects: parsley tea for asparagus beetle; wormwood tea for cabbage moth, snails, slugs, fleas and black flea beetles; and foliar sprays containing garlic for aphids, fungus gnats and white flies. Tea containing petunia leaves, horseradish root or chili peppers is a good general pesticide. Plant other plants near your vegetables that either attract the insects that are beneficial to your garden, or that repel insects that are damaging to your crops. Borage planted near tomatoes or cabbage repels tomato horn worms and cabbage worms. Whiteflies are deterred by nasturtiums, and plantings of mint or peppermint repel aphids, flea beetles and cabbage moths. Some insects are beneficial to your garden, because they prey on other insects that would destroy your crops. Parasitic wasps, lady bugs, Cryptolaemus beetles, lacewings, predator mites and parasitic nematodes all are helpful in controlling garden pests. Plants that attract these beneficial insects include borage, dill, parsley, mint, nasturtium, hyssop, stinging nettle, sweet alyssum, peppermint and sage, if allowed to flower. Floating row covers, traps, barriers, hand picking or a strong spray of water from the hose may be enough to control pests in the early stages of infestation, making harsher measures unnecessary later. Place clear plastic over garden beds for a couple of weeks after the soil has been cultivated and before planting, to heat the soil. This is effective in eliminating many soil-inhabiting pests that may be left from the previous season, such as grubs, weevils, sod webworms and carpenter worms. Plant debris provides the perfect environment for pests and diseases to breed. Removing debris from the garden and away from plants prevents many diseases before they start and creates an environment that is less appealing to pests, eliminating the need for stronger pest and disease controls. Many garden pests do not appear until the air and ground are fully warmed, so planting early spring plantings of vegetables allows crops to mature before they come out, avoiding pests that feast on young, tender growth altogether.